DANVILLE, Kentucky -- The 2012 Vice Presidential Debate is scheduled for tonight, October 11, 2012 at Centre College in Danville, Kentucky from 9:00 p.m. to 10:30 p.m. Eastern Daylight Time (8 p.m. Central Time / 6 p.m. Pacific Time) between Vice President Joe Biden (D) and Congressman Paul Ryan (R). The 2012 Vice Presidential Debate is scheduled to last for 90 minutes. The 2012 Vice Presidential Debate live stream online will appear here 10 minutes before the debate begins tonight. The debate has ended. A replay of the debate is below. 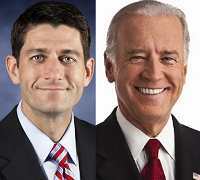 The 2012 Vice Presidential Debate will air tonight on PBS, NBC, CBS, ABC, FOX, CNN, and C-SPAN on television. Viewers can also watch the only Vice Presidential Debate live online on YouTube, AOL, major network, and some network affiliate websites from 9:00 p.m. to 10:30 p.m. Eastern Time. The Biden Ryan Debate tonight will cover both foreign and domestic topics and be divided into nine time segments of approximately 10 minutes each. The Vice Presidential Debate moderator is Martha Raddatz, Senior Foreign Affairs Correspondent, ABC News. The moderator will ask an opening question, after which each candidate will have two minutes to respond. The moderator will use the balance of the time in the segment for a discussion of the question. In the U.S., Mitt Romney leads Barack Obama 48% to 47.3% according to the most recent Real Clear Politics average of polls. This trend was echoed in a Gallup poll released on October 9, 2012 which has Romney leading 49% to 47% among likely voters. A Pew Research poll released on October 8, 2012 found a much larger lead for Romney among likely voters, 49% to 45%. The pressure will be on Vice President Biden to score some debate point to make up for President Barack Obama's poor performance in the first debate. This Vice Presidential debate is the second in a series of four debates. The other two remaining Presidential debates are scheduled for October 16 and October 22, 2012.